Click on Missy's pic to view her full profile. 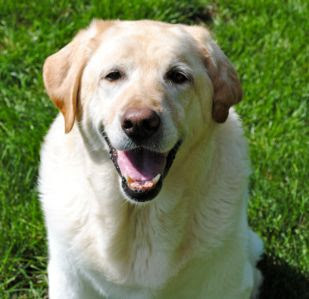 With that ever-present big smile on her face, Missy is the perfect Lab for folks who don't actually want a Lab don't necessarily want all the work associated with young Labs. The saying is Labs don't grow up until they're 7 or 8 years old so Missy has just passed that major milestone and all the hard work is behind her and all the best parts of Lab ownership - a trustworthy, loyal loving companion who is happy just to be with you - await if she becomes part of your family. When I met her at Woofstock, I was impressed with how spry and happy she is - even in a crowd. But really, Missy's best selling point is how loving and lovable she is. She wants to "be your one and only". She was surrendered to North East All Retriever Rescue (NEARR) due to owner illness. She was well-loved and well-cared for. That is obvious from her good nature and demeanor. She deserves to get back what she has lost. Won't you consider making her part of your life or sharing her story with your family and friends? You never know just who might be thinking of adding a beautiful new friend to their family. How precious is she. I love that smile. Hi Missy! I am hoping you find the most wonderful forever home in the whole world! Thanks Donna, she will find her perfect home - we'll make sure of it.